I’ve been busy with articles again this month, including Collecting Halloween: The history of Halloween postcards and costumes at Collector Perspectives. UPDATE: Article is now here. I’ve also written a four-part series on Sewing Pattern History: Part One, Part Two, Part Three, Part Four. Meeting in the middle, there’s also a brief note on antique costume pattern auction news. When a child had passed away, it was traditional for families who could afford it to have a lifesize wax effigy of the child made for the funeral. The wax doll would be dressed in the infant or child’s own clothing. Most often the deceased child’s own hair would be used to make the doll even more realistic. These wax dolls usually show the deceased in repose, eyes closed, as if sleeping. The backsides of the heads were made flat so that the doll would lay nicely when laid out to rest. 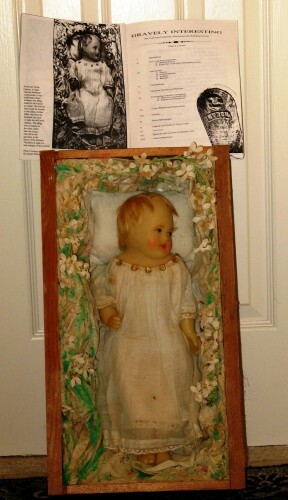 The effigy doll would be put on display at the wake. Often the doll would then be left by the gravesite. But we do know, from the effigy dolls which still exist today, that in some cases these wax effigy dolls were kept. Wax effigies of infants would be placed in a crib, their clothes would be changed, and otherwise treated like a real baby. The bodies of these wax dolls would be cloth, weighted with sand to give it a more realistic feel when being held. Othertimes, the effigy itself would be framed. For older children, just the head and shoulders were created in wax effigy, also with the flat backsides, so that they could be placed in a picture frame. They were the ultimate way to attempt to reject the finality of death of a loved little one. If you’d like to read the entire article, go here. 3 Responses to "Halloween & Other Collectibles Articles For October"
where can I wind the full article plz ? Christian, I have forwarded a copy of the newsletter to your email address!